Reticulated Pythons are without a doubt NOT for the inexperienced. Their huge size coupled with their extremely aggressive nature make this snake extremely dangerous for a new reptile owner. The retic will grow to at least 18' and have been recorded growing up to 33' making them the longest species of snake in the world. I personally have seen what a retic can do if it gets a hold of you. A fellow retic owner I know was bitten and bitten and bitten over a span of about 15 seconds. After leaving the hospital he had a total of 136 stitches in his arm and leg. Once retics attack they do not stop until they feel like it or you get away. I do not tell you this to discourage owning reptiles or even owning a reticulated python, I just want you to know what you're getting yourself into. That being said retics can make wonderful pets if handled correctly by an experienced reptile owner. Housing As with all snakes housing is one of the most important parts of your pets happiness. With a Reticulated Pythons and their size custom housing is the only option. "Retics" can grow up to 10' in the first 18 months, so to get a 20 gallon tank or aquarium would be a waste of money. A good size tank that will house your Retic would be 72"w x 36" x 36"t. Your cage needs to be solid as their strength has been known to crack plexiglas and shatter glass. Hardware cloth stapled into the wood with a pneumatic stapler is the way to go. Once you have your cage set up add logs as they will climb around and be very active when young. They will calm down as they age and get bigger. Substrate (Bedding) There are many different options available to you for the bottom of you Burmese Pythons cage. You can use paper towels, newspaper, astroturf or purchase Reptile Bedding at your local pet store but this can get a bit pricy. My recommendation would be Cypress Mulch. Only about $4.00 at your local Lowes or Home Depot. (NEVER use pine or cedar mulches it can be toxic). Cypress Mulch looks the best in my opinion and allows you to spot clean soiled areas as opposed to totally replacing the bedding. You do however need to completely replace bedding at least every three months to avoid mites and other insect problems. Lighting Lighting is very important. You must be able to allow you Ball to experience both day and night. Therefore you must use some type of lighting (a normal household incandescent bulb will work just fine) during the day to simulate daytime and the light must be turned off to simulate night. If you do use bulbs inside the cage ensure that you have a wire mesh over the bulb to avoid burns. Heating Proper heat is a must. The temperature in the cage should be kept between 80 and 85F with a basking area of about 90F. Basking area can be achieved with a heat rock or overhead ceramic heat source (recommended). With the size your cage should be, the overhead ceramic heat source is the way to go. Make sure if you use the overhead heat source that you keep the fixture outside the cage or place a wire mesh over the fixture to avoid burns. Keep in mind when using a heat rock you must cover the rock with a towel as there is a potential for thermal burns. Never allow the temperature to drop below 73F. Also you should be able to keep the humidity at about 60 to 70%. This can be achieved in a number of ways such as a reptile fogger or even easier spraying you cage 2 to 3 times a week with water. Spray the bedding and the walls. The moisture combined with the heat source will increase the humidity and assist the snake in shedding and its overall well being. Feeding Feeding is one of the most exciting parts of owning a snake. Allow your snake to acclimate to its new surroundings for about two weeks. Reticulated Python hatchlings will start to eat small adult mice once a week, quickly graduating to medium sized rats then large rats. After two years or so you will begin to feed rabbits or chickens 2 or 3 times a month. Snakes will continue to eat if you introduce food but will become obese and unhealthy if you overfeed. There are numerous opinions as to feeding live or pre-killed food. I prefer live food as it is fun to watch, however you must be aware that the food you introduce does have teeth and sharp claws and can harm your snake. Not much of a chance of it killing your snake but scratches and scars will occur. Never feed your snake in the same cage it lives. It will start to identify the opening of the cage with feeding time and make it harder to take your snake out of the cage to handle. NEVER feed wild prey to your snake as they may contain parasites and other diseases. Watering Be sure to provide a fresh bowl of water at all times. This water will be used for both drinking and soaking so make sure that your snake can completely fit in the bowl without knocking it over. Soaking in the water assists in shedding, softening the skin to make it easier to come off in one piece and avoid the nuisance left over skin. 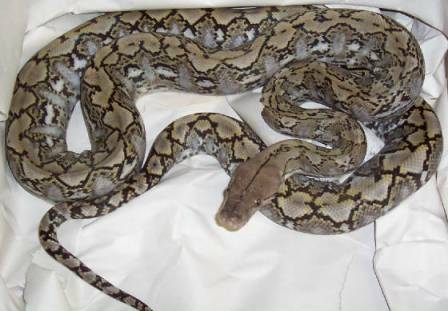 Handling Handle your Reticulated Python as often as possible especially when young. This will ensure as your Retic gets older you will still be able to enjoy handling it. When fully grown it is recommended that you never handle your snake while alone or allow young children to handle without close adult supervision. 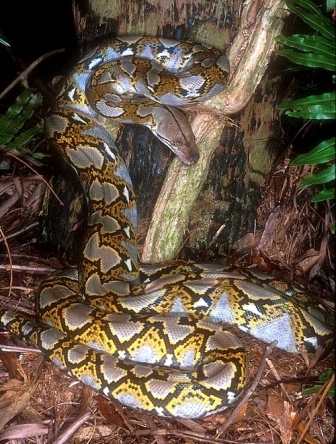 Reticulated Pythons have been documented killing young children mistaken for food. This is not the snakes fault. "Stupidity" is at fault. Reticulated Pythons can make great pets but be smart. Now that you have the basics, enjoy!!! !